As its so close to the end of the month I thought I would try to get a few challenges in while I still have time! As you may have noticed I have been busy completing a belated baby album for my middle daughter (who is now ten) Unfortunately when our computer broke we lost most photos taken from her baby and toddler years which is so sad - I only have two baby photos of my son also! This month I have been eyeing off the Berry71Bleu challenge - to use die cuts in your layout. The prize this months is a stunning paper collection with extra dies from Heartfelt creations. I have been eyeing off some of their products for quite some time, especially their die and stamp sets! 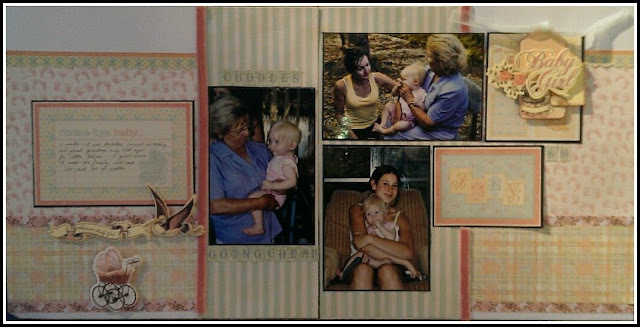 I decided to use a double page sketch from this months Page maps after seeing it used for a couple of other layouts. Of course I only had three photos - but it was perfect just the same! Wonderful 2 page layout--those pictures seem very sweet. Lovely work & great take on the challenge....thanks for joining us at Berry71Bleu! Beautiful, sweet two pager! Thank you for playing along with us at Berry71Bleu! Adorable 2-pager! Thanks for joining us at Berry71Bleu!